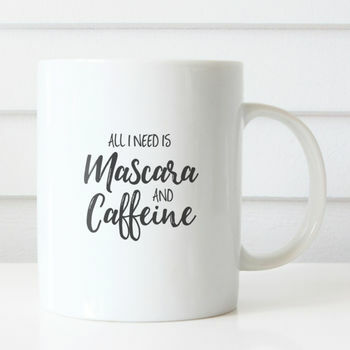 Beautiful ceramic 'All I need is mascara and caffeine' typography mug. 'All I need is Mascara and Caffeine' mug is the perfect gift for all make up and coffee lovers alike! Printed with care in our home studio in Nottinghamshire, wrapped in tissue paper and packed in a gift box.